Janet had asked me a couple of days ago how I move from one place to another in my domestic version of McTavishing around applique pieces. I decided to draw a little diagram to try to explain to her. 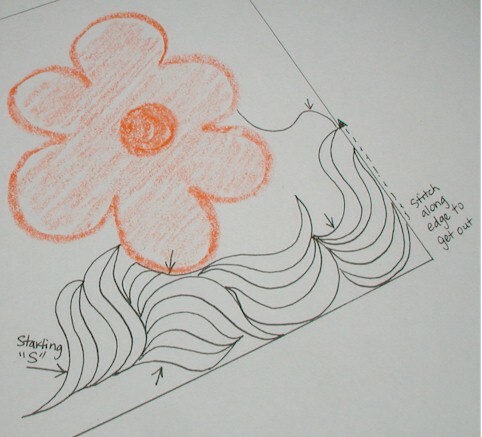 I am sharing with you the diagram here – I hope it makes a bit of sense to maybe help you with your background quilting. First I find a good space to where I can work in an elongated “S” – like what you would see hair blowing in the wind in clip art. Then I repeat the S-es to make a nice little stack. Once the stack gets to be looking monotonous, I change the orientation of my “S” to start a new stack, as indicated by the arrow. And thus, the process repeats again and again. Oftentimes, I have to stitch over previously stitched lines to get out of a bind when I find that I have stitched myself into a corner. That’s not a problem if you are using fine threads (like YLI Silk 100, or Aurifil Mako 50). Then, it’s just stacking and changing direction for me that does the trick in giving my background McTavishing a nice feeling of movement. This is how I have domesticated McTavishing for my faithful Bernina. Mine looks a bit different from the genuine McTavishing because I think each person’s has a slightly different stroke in his/her background quilting is slightly different, as in the case of signatures. So experiment a bit and see what works for you. Thanks for stopping by. I hope you have enjoyed this new installment of my “Thread Talk” series. This entry was posted in Freebies, Ideas, Tutorials, Quilting, Thread Talk and tagged Free-motion quilting tips, McTavshing on my Domestic Sewing Machine. Bookmark the permalink. ← Giveaway: Aurifil Mako 40 Threads – Please scroll down for latest posts! Well, you make it look easy. I do try drawing first like you, so I’ll give it a go. Thanks! 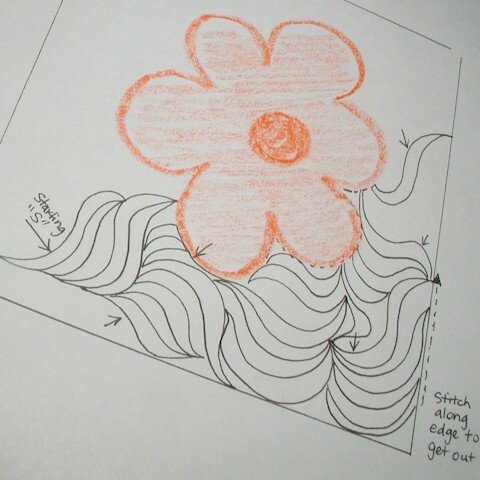 Thats great Wendy – Do you buttonhole your applique or zig-zag..and if so what stitch length do you do. Hope you arefeeling better. 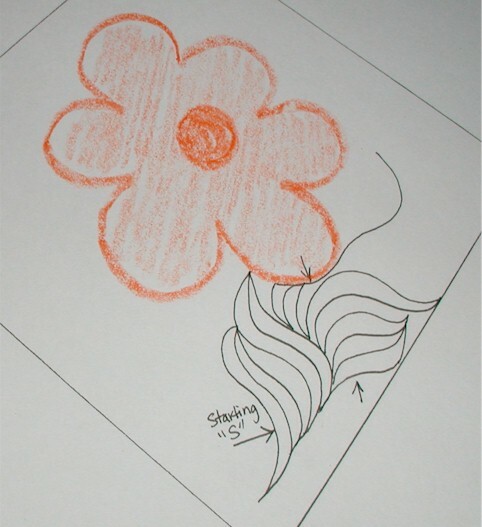 Thats great Wendy – do you buttonhole round your applique or zig-zag…and if so what stitch length? Your McTavishing is awesome. 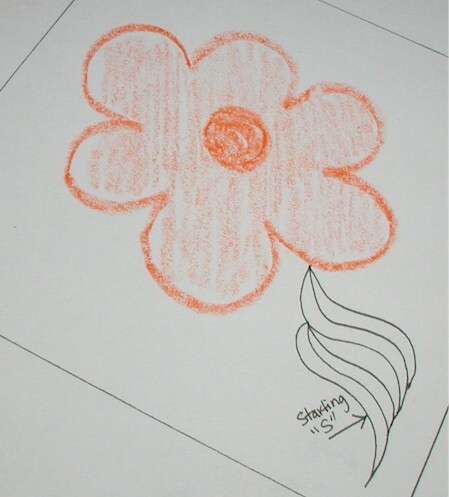 Thank you for the drawing and thank you to Miss Baby for loaning you a crayon. lol It gives me hope that you do all of this on your Bernina, as that is what I have too. I know I need to practice more. I have quite a time drawing feathers. I have been thinking I may need to purchase a DVD for Christmas. I enjoy all your posts, but I read and re-read your thread talk ones. Thanks for sharing your talents. Great tutorial! Makes it sound easy! I’ve got to try it. Thank you! Yes, I did enjoy this — thank you! Absolutely beautiful. Nice to see your drawing too. Beautiful! Didn’t know your fine technique had a name like mctavish. I will definitely be trying this out. You make this look so easy! Thanks for the great tutorial!! I will have to give this a try!! FABULOUS post! I began following your blog with the first Thread Talk posting, and have often wondered how you created such a beautiful, flowing background design. Thanks so much for sharing this! 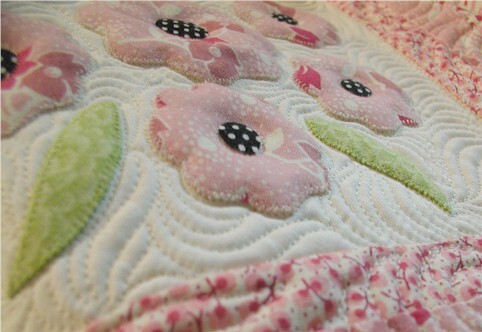 Besides looking at gorgeous machine quilting, learning how the artist created the designs is the most interesting and useful information for me. This is a great post. I will flag it to study as I try my hand at this. I have the McTavish CD, but this is better. Thanks a bunch! Thanks for sharing your steps to McTavishing. I need to sit down with my dry erase board and practice this. this is perfect, exactly what I need to see. I’ve watched a few youtube videos but having it in print really makes it easier to practice. I need to get pen and paper and get started but must get some sleep first. Thank you Wendy and to miss baby for sharing crayons. I’m going on the machine tomorrow to practice. Your diagrams are so clear to follow and understand. 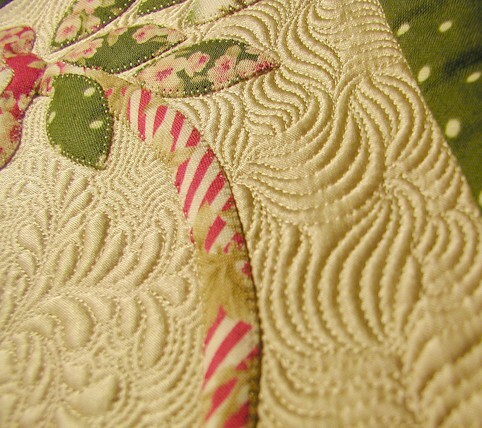 Your machine quilting is always a pleasure to look at. 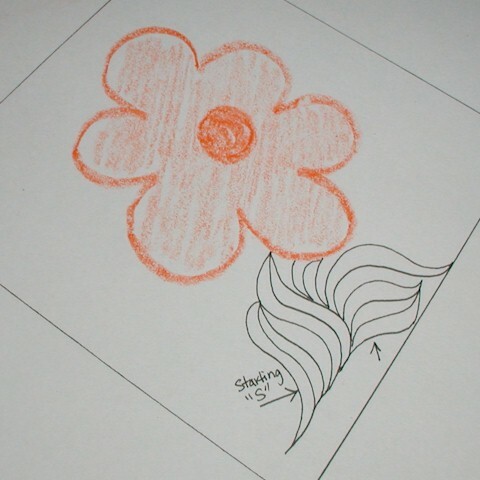 So amazing to see you draw such nice FLOWER and S(es). Haha. I wished I can draw like you! :) that made you the very special one with such special talents! Thanks for this great explaination…..I seem to start fine and get in a corner and lose the s form. So now I have a better idea. Thanks. Great post. You make it looks so easy. I love your quilting. I’m going to try this. I bet I need lots of practice though. Thanks for sharing. I know it is not easy, but you do it with such ease. Lovely work! As always you are right on point! I had bought a book on McTavishing not too long ago and was thinking of trying it out on a scrappy mug rug. 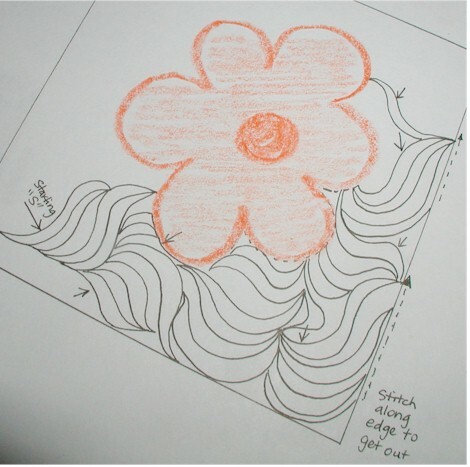 Thanks for giving another perspective on doing the stitch and illuminating us as to how your beautiful quilts get done. It’s a good thing I can’t quilt like you — if I could, I’d never do anything else! Thanks for a great tutorial — even I understand it!! Thank you for this great tuto!!! Loved your tutorial. I know I will be a follower. 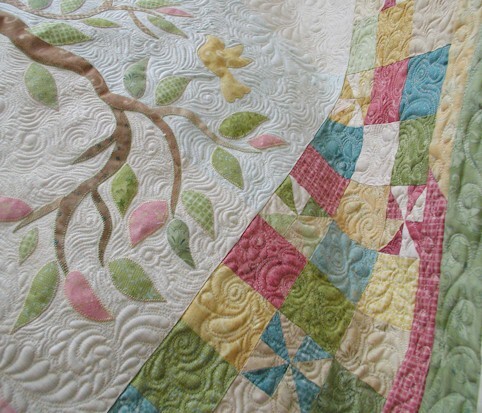 I am so inspired to try this, I am a hand appliqer and quilter at heart, but I am learning to machine applique and quilt. Thanks to Vicki W for pointing the way to you. I looked wonderful free sewing and feathers very thoroughly here today ,thank you very much tutoriál a drawing helps a lot ,hope to learn.but I need much practice ,and drawing . I love your drawings! It really helps understand what you do. I love your work! Thanks for tutorials! It makes a world of difference! Wendy, your Thread Talk posts are amazing. I think you should publish them all in a Thread Talks book — even though I can read them online for free, I’d still be willilng to pay for a reference book like this to keep right next to my sewing machine! I can’t say enough about yur feathers and teaching, especially the examples. I wanted to learn to make the beautiful feathers so badly. I made a copy of one of your feathers on Thread Talk and printed many copies. I began by following the line and arrows you created sewing free motion with no thread. I got to seven the first time and had to stop. Getting older hasn’t been good on my hands. Next day I got better and kept trying evey other day or so until I was comfortable making them. I have now began to sew them on practice squares. Soon I will be able to finish this special quilt I began several years ago giving all thanks to your teaching. Thank you, thank you, thank you for sharing. God bless you and your generosity.. Your work is precious to me. Your explAnations, drawings, and quilt are so very clear. Thank you. Your quilting is lovely. Thanks for sharing your talent with us! You seem to get so much done; I’m so impressed.